Originally founded in 1916, Hawaii Volcanoes National Park (HVNP) is a living, breathing testament to the awesome power of Mother Nature. HVNP is located 30 miles southwest of Hilo and 96 miles southeast of Kona. It's open year-round, 24 hours a day. HVNP is home to Kilauea Volcano, the most continuously active volcano in the world, and the park offers the unique experience of walking on land that is younger than you are. Visitors are also witness to the world's largest volcano Mauna Loa at 13,677 feet. Mauna Loa, meaning 'long mountain,' encompasses a huge chunk of the Big Island. In recognition of its outstanding natural values, Hawai'i Volcanoes National Park has been honored as an International Biosphere Reserve and a World Heritage Site. The park encompasses 333,000 acres of natural wonders and is situated at 4,000 feet above sea level. With its wealth of trails, drives, and activities you will need at least two days to fully experience all the park has to offer. One of the best ways to see Volcanoes National Park is the Volcano Van. They offer exciting volcano tours leaving from the major resort destinations of Hilo, Kona, and Kohala. If a guided tour, which we do highly recommend, isn't for you though - rest assured that you can always opt to view the park from the seat of your own car by taking the park's two primary drives: Crater Rim Drive, an 11-mile ride that circles Kilauea Caldera, and Chain of Craters Road which will receive visitors from the caldera to the coast for a possible glimpse of lava entry into the ocean. A hike out to the current lava flow (when possible) offers a once in a lifetime chance to view Mother Nature at work up close. The current eruption began on January 3, 1983, and is the largest and longest eruption in history. Hiking is the best way to get a real sense of the diversity of the plant and animal life in HVNP. 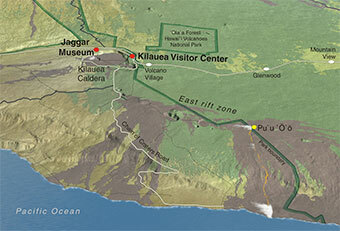 Some favorite trails are Kilauea Iki Trail, Halemaumau, Thurston Lava Tube, Devastation Trail and many more. 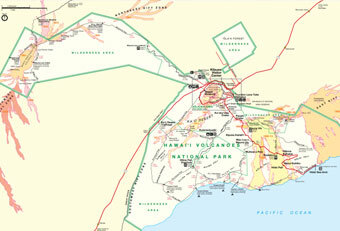 Here we've included a copy of the National Park Service Hawai'i Volcanoes National Park Map or view a full-scale HVNP Overview Map. Both maps are provided courtesy of the NPS. There have been several big changes lately at Kilauea volcano - especially at and within Kilauea Caldera, Halemaumau Crater, Pu'u O'o vent, and along the east rift zone. New (geologically speaking) seismic and visible activity started at Kilauea caldera within Halemaumau in mid-June 2007, and ongoing events between 2007-2008 necessitated several area closures within the park. A lava lake would eventually become visible at the summit within Halemaumau Crater. Beginning in May 2018, another seismic event caused the lava lake to drain from the summit of Kilauea and a new eruption subsequently began within the eastern rift zone (within Puna district). This eruption continues to present day. We encourage visitors to check the National Park Service Kilauea Volcano Activity page or the USGS Volcano Update page before visiting the park. Hawai'i Volcanoes National Park is open 24 hours a day year-round. Kilauea Visitor Center is open daily from 7:45 a.m. to 5:00 p.m. and Jaggar Museum is open daily from 8:30 a.m. to 5:00 p.m. "Born of Fire... Born of the Sea" is the featured 25-minute film that is shown in the Kilauea Visitor Center on the hour throughout the day, starting at 9:00 a.m. with the last film shown at 4:00 p.m. Entrance to the park (a seven-day permit) is $10.00 per vehicle, $5.00 for pedestrians or bicyclists. Fees for those arriving by commercial bus or tour vary by passenger capacity. Persons holding a Golden Age Passport (available to U.S. citizens or residents 62 years of age or older for a one-time fee of $10.00) or Golden Eagle Passport are admitted free of charge. An annual pass may be purchased for $20.00 which allows access for 1 full year at Hawai'i Volcanoes National Park, Haleakala National Park, and Pu'uhonua o Honaunau National Historical Park. The volcano is a living, breathing park that has an ever-changing landscape. For updates on any closings in HVNP visit Area Closings and be sure to check our current Hawaii Volcano Updates page. You never know when Madame Pele will send her lava flows but the crew at HVNP keeps close tabs on the flows. Visit the USGS Lava Flows page if you have any respiratory or heart problems or are traveling with the elderly, children or pregnant women it is wise to determine the quality of the air in the park. Hawaii Volcanoes National Park is located on the Big Island of Hawaiii. From Hilo: it's 30 miles southwest on Highway 11; from Kailua-Kona: it's 96 miles southeast on Highway 11, or 125 miles through Waimea town and Hilo via highways 19 and 11 respectively.